Shanghai is a city of contrasts, which makes it a particularly tantalizing locale to explore. In recent years, an explosion of luxury hotels, upscale shops, and vibrant nightlife has given the city an international glamor that is quickly making it one of the premier destinations in Asia. At the same time, pockets of the layered history that shaped its architecture and culture remain visible, allowing visitors to witness the many stages of its unique transformation in a vivid and engaging way. 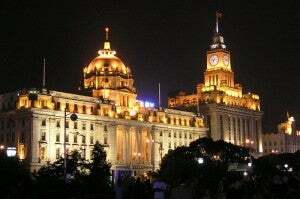 The Bund is one of the most popular tourist destinations in Shanghai. The city is built along the Huangpu River, a mile-long region of which, known as The Bund, was shaped by its time as a British settlement. It is lined with turn-of-the-century architectural delights – including Beaux-Arts, Art Deco, Gothic and Romanesque buildings – and makes for a picturesque spot to stay or sightsee and shop. It is also an epicenter for the city’s burgeoning foodie scene, and as many of the restaurants offer breathtaking views – having dinner here at least once is a must. Top dining destinations include M on the Bund, which offers traditional Chinese dishes, and Mr. & Mrs. Bund, with its French-influenced fare. Among the area’s landmark buildings are the former Shanghai Club (once the go-to gathering spot for British Nationals, which became the Waldorf-Astoria Shanghai Hotel in 2010) and the Customs House, which has a tower that was constructed to look like Big Ben in London. An example of a typical shikumen building is the First National Congress of the Communist Party of China. The French Concession is the region of Shanghai that once housed the city’s French settlement and retains a quaint charm thanks to tree-lined streets and mansions dating back to this time. The Central Huaihai Road offers high-end shopping options and a concentration of 19th-century shikumen-style residences, which meld Western influences and Eastern traditions into whimsical gated row houses with Chinese accents. This neighborhood is also the place to peruse one-of-a-kind garments created by up-and-coming local designers with their own stand-alone boutiques. Hengshan Road has become a nightlife destination with many bars and clubs. In the Xintiandi region, many shikumen houses have been refurbished into a fashionable, car-free shopping area that includes restaurants and boutiques featuring brands like Shanghai Tang. The Shikumen Open House Museum provides an opportunity to see what life was like for inhabitants of such a house, and the Museum of the First National Congress of the Chinese Communist Party contains exhibitions related to Communist history. 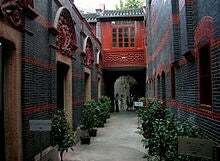 Another French Concession residence that has been turned into a popular museum is that of Dr. Sun Yat-sen, a revolutionary who is recognized for having founded modern China in the early 20th Century. The exterior of the Shanghai Museum on People’s Square. 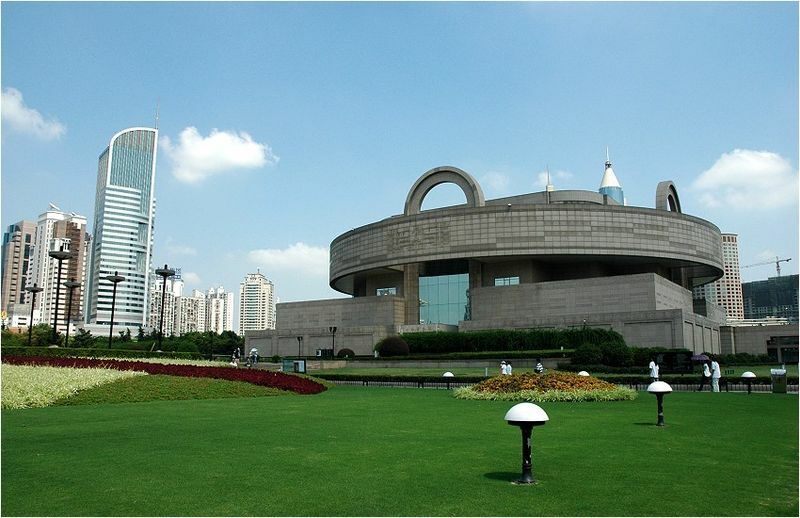 Learn about the city’s most ancient history at the Shanghai Museum, in the central Huangpu district, one of the world’s most densely populated urban areas. The museum’s permanent exhibitions include a spectacular collection of artifacts, artwork and furniture, including that from the Ming and Qing dynasties. Its location on People’s Square lends itself to a nice afternoon with a stroll over to the square and its park, and then along the nearby Nanjing Road, the city’s main shopping thoroughfare. On West Nanjing Road is Jing’an Temple, or the “Temple of Peace and Tranquility,” a Buddhist temple first built in a different location in 247 AD. That temple was moved to this site in 1216 and then rebuilt during the Qing Dynasty. Across the street is the picturesque Jing’an Park. Art aficionados will also want to visit M50, located on Moganshan Road, which houses more than 120 galleries in a renovated industrial mill, and offers a crash course in Shanghai’s budding contemporary art scene. Very popular with travelers, the Yu Garden has a bit of the over-the-top kitsch of Times Square and other tourist spots, but that also makes it the perfect place to shop for fun souvenirs and gifts. Vendors sell their wares from a warren of small shops offering everything from Buddha figurines and decorative fans to Chairman Mao memorabilia. Also, at the heart of this area is its namesake park, where it’s possible to visit the home of a 16th century aristocratic family, with pagoda-style buildings nestled amid picturesque ponds and trees. This area is also a great spot to eat one of the city’s signature dishes, dumplings. Across the street from Yu Garden is renowned dumpling purveyor Din Tai Fung. The skyline of Pudong, a district of Shanghai. 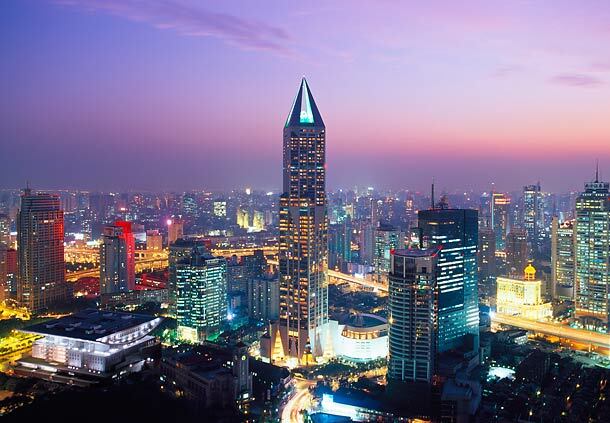 Across the Huangpu River from downtown Shanghai, the neighborhood of Pudong has become an epicenter of business, high-end shopping and luxury accommodations. With a sleek, larger than life aesthetic reminiscent of some of the new, luxe boutiques and hotels in Las Vegas, the region’s dramatic complexes house top designers from Yves Saint Laurent to Marc Jacobs. While there, visit the Shanghai World Financial Center, which offers a bird’s-eye view of the city from the observation deck on the 100th floor. Another popular destination is the Oriental Pearl Tower, a television tower with a space-needle design that was the city’s highest building until it was eclipsed by the Shanghai World Financial Center in 2007. It remains an iconic part of the city’s skyline and includes five observation decks, one with a restaurant. Terminal 1 of Shanghai Pudong International Airport. The Shanghai Pudong International Airport is located 19 miles east of downtown Shanghai. The city’s other major airport, Shanghai Hongqiao International Airport, primarily services domestic flights. Pudong, which saw 40 million passengers pass through it in 2011 and is expected to see as many as 60 million passengers by 2015, is undergoing expansion. 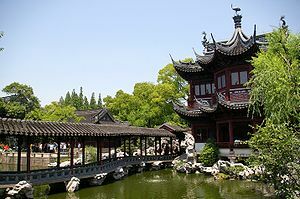 Currently, the airlines that serve Shanghai include American Airlines, with gateway cities of Chicago-O’Hare and Los Angeles; Delta, with Detroit as its gateway city, and plans for a Seattle/Tacoma route to begin in June 2013; and United, with gateway cities of Chicago-O’Hare, Newark, Los Angeles and San Francisco. 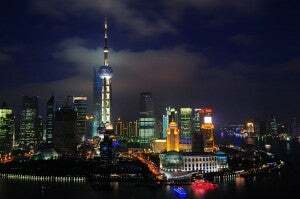 Pudong is the main hub for China Eastern Airlines and Shanghai Airlines, and a major international hub for Air China. 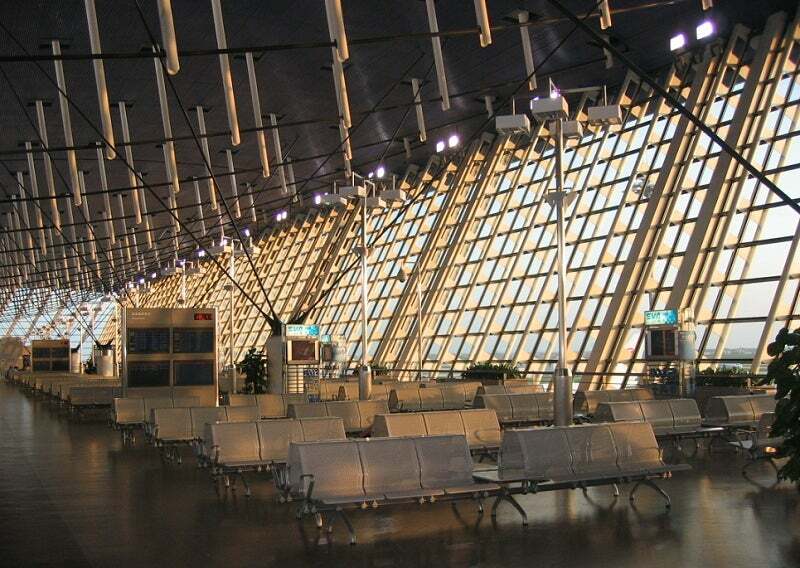 The airport is located on Metro Line 2 and the Shanghai Maglev Train. There are several bus lines, leaving every 15 to 20 minutes, which will take passengers to downtown Shanghai. A taxi to downtown averages around 150 CNY ($24 USD). 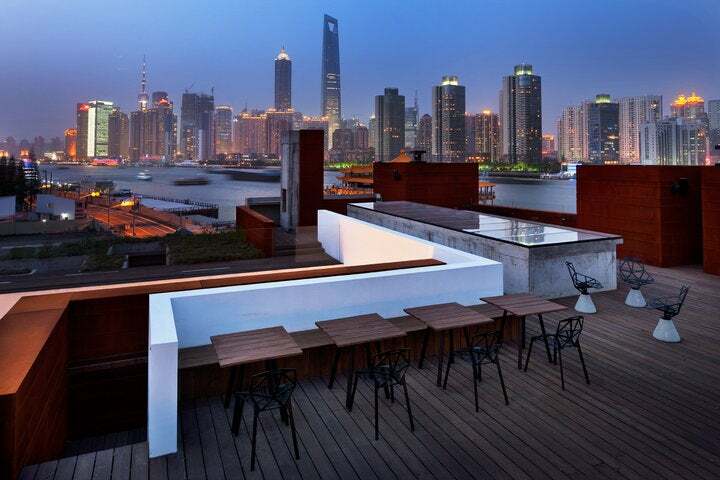 When it comes to accommodations, Shanghai is home to a myriad of options, from the most celebrated international powerhouses, to up-and-coming luxury hoteliers who are breaking out in Asia. From the sleek and ultra-modern, to the elegant and refined, there is a points-friendly hotel for every taste. 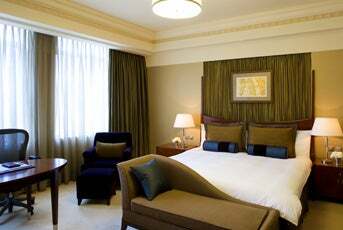 Superior king guest room at the Radisson Blu Hotel Shanghai New World. 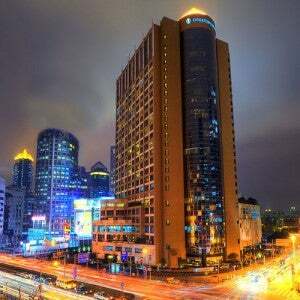 Radisson Blu Hotel Shanghai New World: Located on the Nanjing Road, this property overlooks the People’s Square Park. Its 208-meter tower features a revolving restaurant with panoramic views of the city and is an iconic staple of the city skyline. Guest rooms include complimentary in-room WiFi. Amenities include a spa, fitness center and swimming pool bathed in natural sunlight. The hotel offers five dining and drinking options, including Epicure on 45, with its 360-degree views and East Asian delicacies prepared by chefs in two show kitchens. Mingxuan Noble House serves traditional fare from Canton and Shanghai and offers 12 private dining rooms.Rates in January begin at 1100 CNY ($177 USD) or 44,000 points per night. 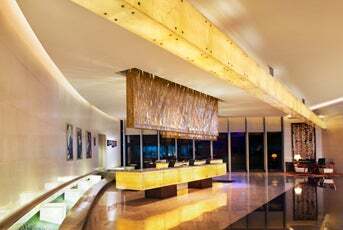 Radisson Blu Plaza Xing Goa Shanghai: This boutique hotel is located amid historic gardens five minutes from the Central Business District and has 190 guest rooms and 40 suites. The rooms have a writing desk and free high-speed WiFi. The hotel offers foreign currency exchange and babysitting services. Dining options include Café Li, featuring European and Asian flavors, Cantonese restaurant Li Palace, and the casual grill fare of the Tavern Bar & Grill. Cocktails are served in The Lounge.Rates in January begin at 1100 CNY ($177 USD) or 44,000 points per night. Other Carlson properties in Shanghai include theRadisson Blu Hotel Shanghai Hong Quan,Radisson Blu Hotel Pudong Century Park,Radisson Blu Hotel Pudong Airport. Two additional Carlson properties will be opening in Shanghai in the next several years. Exterior at the Waldorf Astoria Shanghai on the Bund. Waldorf Astoria Shanghai on the Bund: This luxury hotel located on the historic Bund is housed in a restored heritage building modernized with the addition of a contemporary tower. Guest rooms include complimentary in-room WiFi, a pillow menu and marble-finished bathrooms. Amenities include a fitness center, pool, florist, 24-hour staffed business center, and celebrity stylist Tony Li’s salon. The hotel’s six dining and drinking options include Pelham’s, which serves modern, New York City-inspired fare, and the historic Long Bar where stylish expats come to quaff martinis. Dedicated butlers and personal shoppers are available.Rates in January begin at 2300 CNY ($370 USD) or 50,000 HHonors Points per night. Twin deluxe guest room at the Hilton Shanghai. Hilton Shanghai Hotel: This property is located in the former French Concession amid the city’s business and entertainment district. Guest rooms feature large work areas and complimentary WiFi. Some rooms offer opening windows and LCD flatscreen TVs. There is a spa, pool and fitness center with tennis and squash courts. As for restaurants, Leonardo’s serves healthy Mediterranean cuisine, while the Atrium Café features an international menu and buffet, and People on the Water allows diners to choose fresh seafood from the restaurant’s displays and have it prepared Ningbonese-style amid a rock garden, streams and a waterfall. The Penthouse Bar on 39 offers beautiful city views. Also located on the 39th floor, Sichuan Court serves traditional dishes like tea-smoked duck.Ratesin January begin at 1290 CNY ($207 USD) a night.This is an HHonors RewardCategory 5property and requires35,000 HHonors Pointsfor a free-night redemption. Hilton’s other properties in the city include the Doubletree by Hilton Hotel Shanghai – Pudong and the Hilton Shanghai Hongquiao. Infinity pool at the Park Hyatt Shanghai Hotel. 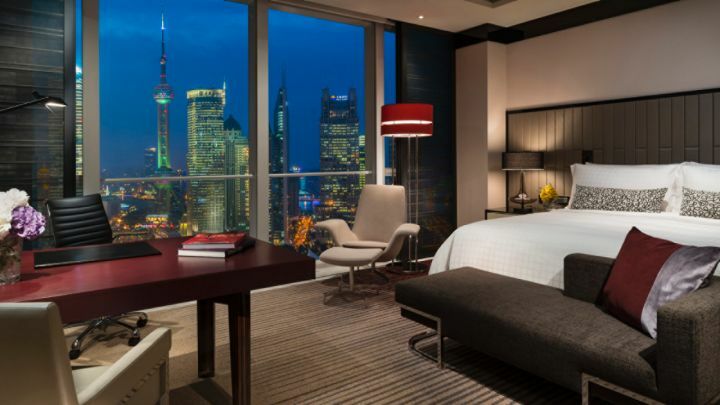 Park Hyatt Shanghai: This boutique hotel located on the Shanghai World Financial Center’s 79th to 93rdfloors offers 174 guest rooms with views of the Huangpu River or the city’s Lujiazui financial district. Guest rooms include in-room espresso machine, complimentary WiFi, walk-in rain shower, spa tub, and heated floors. Amenities include Water’s Edge spa, a fitness center, pool, and Tai Chi courtyard featuring instruction. Dining options include the Western, Chinese and Japanese offerings at 100 Century Avenue Restaurant, and the formal European fare at the Dining Room, as well as lounges and casual dining options. The Chef’s Table is a 12-seat dining room offering a private chef and access to a 300-bottle wine cellar. Afternoon Tea is offered daily at the Living Room. The Music Room, featuring live music and DJs, and located on the 93rd floor, prides itself for being the world’s highest nightclub.Rates in January begin at 2300 CNY ($370 USD) per night.This is aCategory 5property and requires18,000 Hyatt Gold Passport Pointsfor a free-night redemption. Marble bathroom at the Grand Hyatt Shanghai. Grand Hyatt Shanghai: Located in the Jin Mao Tower in the heart of Pudong’s Lujiazui business district, this modern luxury hotel offers 555 rooms and suites. Guest rooms are appointed with an Eastern take on Art Deco design and feature high speed WiFi access, complimentary bottled water, and a marble bathroom with walk-in shower and deep-soaking bathtub. The Club Oasis Spa offers Chinese medical massages and spa treatments. There is a fitness center, pool, and shopping arcade, and Shanghai city tour arrangements can be made. The hotel’s six restaurants range from the casual Western and Shanghainese fare offered 24-hours a day at Grand Café, to the more formal Cantonese Restaurant Canton, Japanese food at Kobachi, and Club Jin Mao, which the hotel bills as the city’s most prestigious Shanghainese restaurant. Cloud 9 Bar is located on the 87th floor of the Jin Mao Tower, offering guests city views along with a resident DJ, signature cocktails, tapas, and table-side entertainment.Rates in January begin at 1600 CNY ($257 USD) per night.This is aCategory 4property and requires15,000 Hyatt Gold Passport Pointsfor a free-night redemption. King guest room at the Andaz Shanghai. Andaz Shanghai: The first of Hyatt’s Asian Andaz collection of boutique-inspired hotels, this 28-story hotel is located in Shanghai’s Xintiandi region, known for its distinctive Shikumen-style architecture. The property’s 307 guest rooms, including 47 premium rooms and suites, offer adjustable LED lights, complimentary minibar snacks and nonalcoholic beverages, and WiFi, and in the bathroom, heated floors and a translucent tub. Amenities include the Optime Spa with its Technogym equipment and ten en-suite rooms for spa and reflexology treatments. Dining options include Hai Pai, meaning modern Shanghainese spirit, which offers a mix of Chinese and French fare, and Éclair, which specializes in its namesake. Sunday brunch, afternoon tea and Friday night happy hour are also offered.Rates in January begin at 1760 CNY ($282 USD) per night.This is aCategory 4propertyand requires15,000 Hyatt Gold Passport Pointsfor a free-night redemption. SeeTPG’s full review. Hyatt also offers a riverfront property in Shanghai, theHyatt on the Bund Hotel. Exterior shot of the JW Marriott Hotel Shanghai. JW Marriott Hotel Shanghai at Tomorrow Square: This distinctive 60-story tower is located in the downtown Puxi region across from the People’s Square Park, offering convenient access to green space, as well as the Clock Tower, Museum of Contemporary Art, Shanghai Museum and Grand Theater. The hotel’s 38th-floor lobby and its lounge features 360-degree views of the city. Guest rooms offer the option of Marriott’s “Revive” specialty bedding line. Amenities include a spa, 24-hour health club with Jacuzzi, sauna and steam room, indoor and outdoor pools, and complimentary weekend shuttles to Xintiandi and the Bund. Dining options range from traditional American fare at JW’s California Grill to Cantonese, dim sum and Shanghainese delicacies at Wan Hao Chinese Restaurant, as well as casual international fare in the Marriott Cafe.Rates in January begin at 1580 CNY ($254 USD) a night.This is a MarriottCategory 6propertyand requires30,000 Marriott Rewards Pointsfor a free-night redemption. Lobby area at the Ritz Shanghai Pudong. The Ritz-Carlton Shanghai, Pudong: Housed in the upper floors of a 58-story tower in the heart of the Pudong district’s Lujiazui Finance and Trade Zone, this property features 285 luxury hotel rooms and suites offering views of the Bund. Guest rooms are located on the 39th to 51st floors and include Art Deco design, a Sealy bed with 400-thread count Frette linens, high speed WiFi, and a Bose music system with iPod dock. Guests staying on the Club Level also enjoy 24-hour access to the Club Lounge, personalized stationary to be used during their stay, and an S Class Mercedes Benz for short trips. 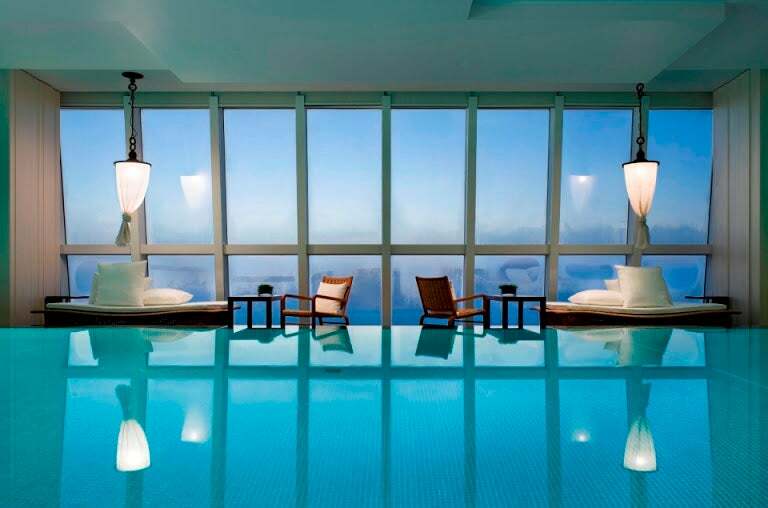 Amenities include a spa, 24-hour fitness center and pool, offering a view from the 53rd floor. Dining and drinking options include the casual Italian eatery, Scena, and the more formal Jin Xuan, which serves traditional Cantonese cuisine. Flair lounge, located on the 58th floor offers tapas and a raw bar on a patio with sweeping views.Rates in January begin at 2400 CNY ($385 USD) per night.This is a Ritz-Carlton RewardsTier 5property and requires70,000 Pointsfor a free-night redemption. Renaissance Shanghai Yu Garden Hotel: This property features 341 contemporary rooms and suites in downtown Shanghai, convenient to tourist destinations including the Yu Garden and Old Town. Guestrooms feature modern design, including bright colors and glass-enclosed bathrooms and offer high-speed Internet access. International and organic cuisine is served all day at the Yu Garden Café, while China Bistro serves contemporary Chinese cooking, and Yu Sushi offers contemporary Japanese fare. The Yu Bar offers coffee and cocktails with a view of Old Town. Amenities include a fitness center and indoor pool.Rates in January begin at 808 CNY ($130 USD) per night.This is a Marriott RewardsCategory 4property and requires20,000 Pointsfor a free-night redemption. Lobby area at the Shanghai Marriott Hotel City Center. 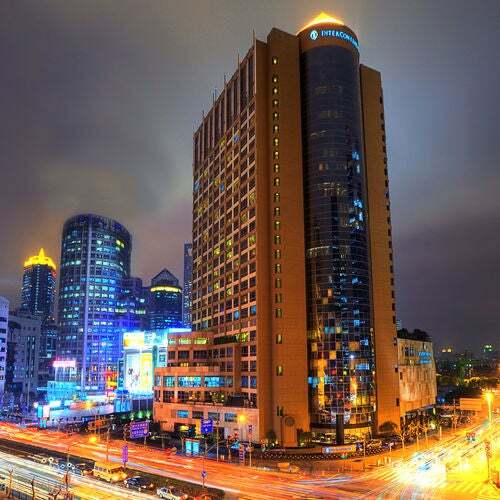 Shanghai Marriott Hotel City Centre: In the center of Shanghai’s Central Business District, this property offers 720 guest rooms and suites within walking distance of Nanjing Road Pedestrian Street, the Bund, and several Metro lines. 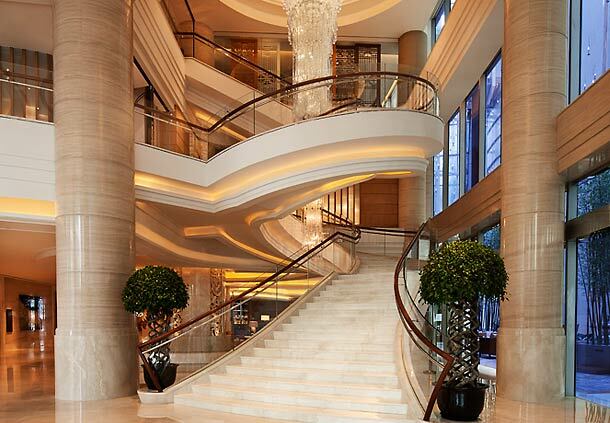 The dramatic lobby includes a three-story grand staircase that leads up to the hotel’s restaurants. Guest rooms include coffee/tea service, iPod docking stations, and 42-inch LCD TV. Amenities include a spa featuring treatments and massage lessons, and a fitness center with pool and a personal trainer available by appointment. On the second-level, the Inagiku Japanese Restaurant serves traditional Japanese fare including its namesake tempura, while on the third-level, contemporary international cuisine is prepared in Shanghai City Bistro’s open kitchens. Man Ho serves authentic Cantonese dishes. There is also a lounge and deli.Rates in January begin at 1380 CNY ($222 USD) per night.This is a Marriott RewardsCategory 4property and requires20,000 Pointsfor a free-night redemption. Other Marriott properties in Shanghai includeThe Portman Ritz-Carlton, Shanghai,Shanghai Marriott Hotel Hongquiao,Shanghai Marriott Hotel Changfeng Park, andShanghai Marriott Hotel Luwan. Hotel Indigo Shanghai on the Bund: Taking its cue from the cultural heritage of its location on Shiliupu Dock, once Shanghai’s gateway to the world, this unique property’s lobby displays sculptures made from reclaimed artifacts from the waterfront. Guest rooms include complimentary Wi-Fi and beverages, a trouser press, and opening windows. Amenities include an infinity pool and fitness center with a view of Huangpu River, a 24-hour lounge, and the multi-purpose space Quay, which includes a library, boardroom and light refreshments. The hotel’s restaurant, CHAR Bar and Grill is a steakhouse located on the top three floors.Rates in January start at 1480 CNY ($238 USD) or 20,000 Priority Club Points + $40 USD. Exterior of the Intercontinental Shanghai Pudong. 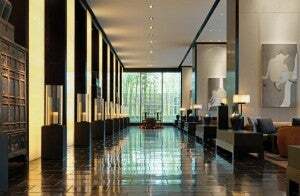 Intercontinental Shanghai Pudong: Located on the dynamic Zhanjiang Road in the heart of Pudong’s Lujiazui region, this property is central to business and shopping destinations. The 398 recently renovated guest rooms include LCD TVs and DVD players, coffee/tea service, and opening windows. Amenities include a 24-hour fitness center with personal trainers, and a spa that blends Eastern philosophies with Western techniques. The property’s restaurants include Level One Café-Sushi Noodle and the Oriental House, which serves authentic Chinese cuisine from regions including Shanghai and Canton.Rates in January start at 1280 CNY ($205 USD) or 25,000 Priority Club Points + $40 USD. 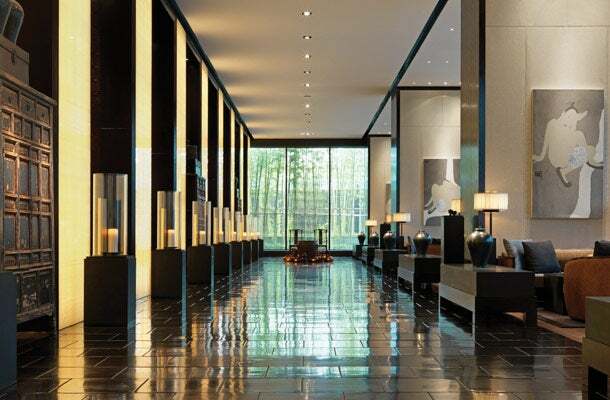 Priority Club also has theInterContinental Shanghai Ruijinin Shanghai. And within 20 miles of the city center, there are 16 Holiday Inns, 7 Crowne Plazas, and one other InterContinental property. Lobby area at the Le Royal Meridien Shanghai. Le Royal Meridien Shanghai: A dramatic 66-story tower located on the Nanjing Road Pedestrian Street in the city’s central business district, this property offers 761 guest rooms with floor-to-ceiling windows offering sweeping views. Amenities include childcare, butler service, complimentary self-parking facilities and Le Spa, which offers a gym, indoor swimming pool with Jacuzzi, sauna and steam room, sundeck, juice bar and eight private treatment rooms. A wide range of dining and drinking options are available in six venues, including seasonal Italian fare and pizzas at Favola Italian Restaurant, fine French dining at Allure Fine French Cuisine Restaurant, and Cantonese at Ai Mei Chinese Restaurant. The hotel’s new signature breakfast was created exclusively for the property by three-star Michelin Chef Jean-Georges Vongerichten.Rates in January start at 1150 CNY ($185 USD) a night.This is aCategory 5hotel requiring12,000 Starpointsfor a free night. King guest room at Twelve at Hengshan, Shanghai. Twelve at Hengshan, Shanghai: Newly opened in November 2012, this property offers 171 rooms on the tree-lined Hengshan Road with its concentration of restaurants and boutiques. Guest rooms include balconies, floor-to-ceiling windows, iPod docking station and sound system, rainforest shower, in-room espresso maker and complimentary high-speed WiFi. Amenities include a hair salon, shopping gallery, fitness center with heated pool, and spa with massage and spa services. Cantonese cuisine is served at 12 Henghan, while casual contemporary options are offered at the Lobby Lounge and Tops & Terrace.Rates in January start at 1280 CNY ($205 USD) a night.This is aCategory 6hotel requiring20,000-25,000 Starpointsfor a free night. King guest room at the Hongta Hotel Shanghai. 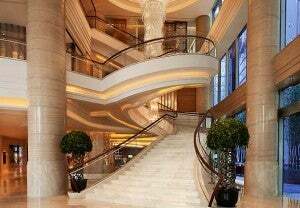 The Hongta Hotel, Shanghai: Located in Pudong, near the Bund and Century Park, this Starwood hotel offers 328 rooms in an elegant setting. Guest rooms are decorated in soothing bronze tones accented with Chinese art and ceramics. They include an Aeron chair, rainforest shower, and the hotel’s custom-designed pillow-top mattress. Guests enjoy access to an international travel agency, spa featuring hot stone massage, and fitness center with aerobics and yoga classes, an outdoor tennis court and indoor lap pool. Executive Floor and Suites guests also have a dedicated butler. Dining options include modern Italian cuisine at Danieli’s Italian Restaurant, and all-day dining at Saints International Restaurant.Rates in January start at 988 CNY ($159 USD) a night.This is aCategory 4hotel requiring10,000 Starpointsfor a free night. Other Starwood properties in Shanghai include:The Westin Bund Center, Shanghai;Le Meridian She Shan Shanghai;Four Points by Sheraton Shanghai, Daning;Four Points by Sheraton Shanghai, Pudong; Sheraton Shanghai Hongkou Hotel;Sheraton Shanghai Hongqiao Hotel; andSheraton Shanghai Pudong Hotel & Residencies. 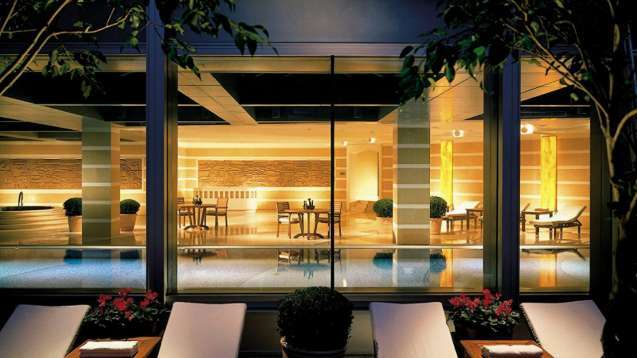 Four Seasons Hotel Shanghai: This 37-story luxury hotel offers a tranquil respite in bustling downtown Shanghai, near the Nanjing and Huaihai Roads. It features 422 rooms, including those on the couples-only floor and those on the 37th-floor Executive Club level with access to its Executive Club Lounge. Guest rooms are appointed in warm gold with bold red accents and include an iPod alarm clock and marble bathroom with deep soaking tub and L’Occitane products. Amenities include a 24-hour fitness center, indoor pool, spa offering traditional Chinese medicine, massages, and spa treatments, and a hair salon. Dining options include Café Studio’s Shanghainese and Asian-inspired comfort food dinner buffet, dim sum at Si Ji Xuan or teriyaki at Shintaro, as well as private dining at Steak House, and cocktails in the Lobby Lounge.Rates in January start at 1700 CNY ($273 USD) a night. King guest room at the Four Seasons Pudong. 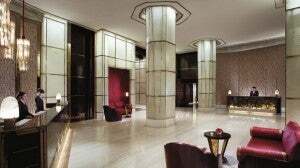 Four Seasons Hotel Pudong, Shanghai: Featuring 187 luxury guest rooms, 15 suites, and an Executive Club Floor in the Pudong financial district, this property updates classic Shanghai Art Deco with a contemporary edge. Guest rooms feature floor-to-ceiling windows, an iPod docking station, and complimentary overnight shoeshine service. Amenities include a 24-hour fitness center, indoor pool, babysitting services and other special items for children. FLARE spa offers entirely bespoke service, and includes VIP suites with whirlpool and rain shower for two, plus spa treatment rooms. Dining options include the western-style Camelia, with its wine lounge and outdoor terrace, and Shang-Xi, which serves Shanghainese fare with Cantonese accents.Rates in January start at 1800 CNY ($289 USD) a night. Pudong Shangri-La, Shanghai: Located in a sleek skyscraper in the Pudong neighborhood, this property includes 952 rooms and suites in its River Wing and Grand Tower. Guest rooms include marble bathroom, coffee/tea service, and complimentary WiFi. 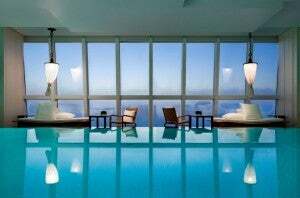 Amenities include a clinic, two fitness centers and pools, a beauty salon, photo processing service, travel agency, childcare, cigar shop, florist, tailor, Rolls Royce and Mercedes Limousine Service, and the spa, CHI, which practices traditional Asian healing methods in a luxurious setting. Dining options include Cantonese food at the opulent Fook Lam Moon, the French-inspired Jade on 36, with a bar featuring live jazz music, Japanese Kaiseki-ryouri at Nadaman Japanese Restaurant, sushi at Sushi by Nadaman, and the in-house dessert house, Gourmet.Rates in January start at 1800 CNY ($289 USD) a night. The PuLi Hotel and Spa: An urban resort in the heart of downtown Shanghai, this property is an elegant oasis overlooking JingAn Park. Guest rooms include classic Chinese decorative accents, valet and laundry services, an iPod dock, high-speed WiFi, a Nespresso coffee machine, and rain shower. Amenities include a fitness center, infinity pool, sauna, Jacuzzi tubs, steam rooms, and the Anantara Spa, which offers five treatment suites with steam and shower rooms and treatments from China, Thailand and India. Dining options include seasonal international fare at Jing’An Restaurant, cocktails and light bites at the Long Bar, and the Garden Terrace, where lunch, afternoon tea and drinks are served to guests on plush lounge chaises.Rates in January start at 1547 CNY ($248 USD) a night. 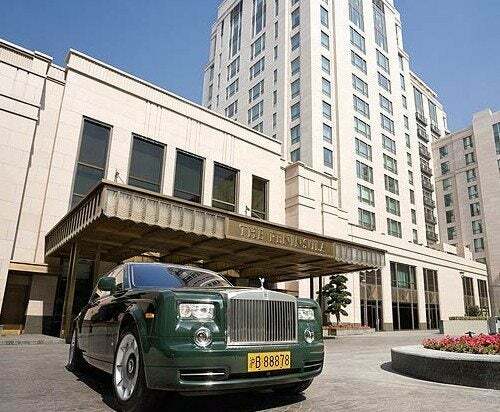 The Peninsula Shanghai: Located on the historic Bund, this property offers views of the Huangpu River, Pudong and the former British Consulate’s gardens. The 235 guest rooms and suites include a 46-inch plasma TV, iPod docking station, complimentary WiFi, and Nespresso coffee machine. Amenities include a spa featuring spa treatments and foot reflexology, Naturally Peninsula healthy cuisine available both at the spa and the hotel’s dining rooms, and a fitness center with an indoor pool featuring Art Deco fireplace and terrace access. Traditional afternoon tea is served in The Lobby, where food is available all day, while modern European cuisine is served at Sir Elly’s Restaurant, and contemporary takes on traditional Chinese cuisine is available at Yi Long Court.Rates in January start at 2500 CNY ($401 USD) a night. The other Fine Hotels and Resorts properties in Shanghai are ThePortman Ritz-Carlton, Shanghai;The Ritz-Carlton Shanghai, Pudong;Park Hyatt Shanghai;The Hongta Hotel, Shanghai;Waldorf Astoria Shanghai on the Bund. 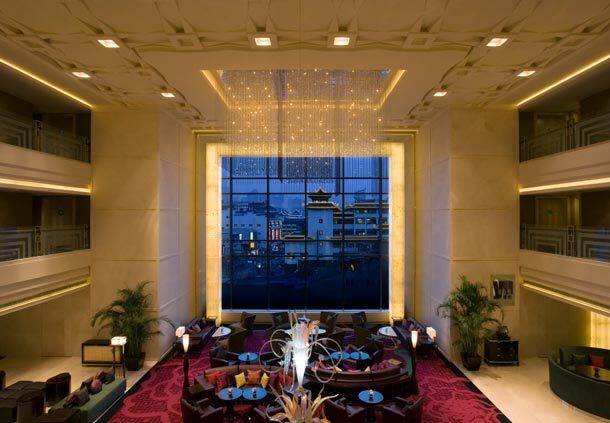 Fairmont Peace Hotel: A destination for diplomats and celebrities in the 1930s, this property overlooking the Huangpu River was restored and reopened in 2010. Guest rooms are decorated in an Art Deco style and feature high-speed WiFi, Illy espresso machine, and marble bathrooms with a bath-side LCD screen-TV, claw foot tub and Miller Harris products. Amenities include a fitness center with personal training and fitness classes, a pool, sauna and steam room, the Willow Stream Spa and Boutique, childcare, medical services, and the Peace Gallery featuring items from the hotel’s history. The property offers traditional afternoon tea as well as six dining and drinking options from Cin Cin, featuring a wine cellar and cigar bar, to the traditional Cantonese and Shanghainese cuisine at Dragon Phoenix, and the European cuisine of The Cathay Room.Rates in January start at 2000 CNY ($320 USD) a night. Rooftop terrace bar at Waterhouse at South Bund. The WaterHouse at South Bund: Opened in July 2000, this unique 19-room boutique hotel is located in a renovated 1930s warehouse. Each guest room has an individual flavor, with some offering views of the Huangpu River and some offering balconies. Dining options include Table N1°, serving contemporary European cuisine in modern setting, the Lobby Bar with its afternoon tea, cocktails and light fare, and the Roof at Waterhouse, where signature cocktails and bar food are served in the open air.Rates in January start at 1200 CNY ($192 USD) a night.